Finding a clean and beautiful church WordPress theme isn’t that difficult anymore. Did you know that there are over 10000 themes available today? Whether you did or not, you still have to admit that’s a huge number. These days, you can basically find a WordPress theme for every business and organization possible. Churches are no different. There are hundreds of great options out there, especially since developers noticed that churches are now more interested than ever in building an online following. We live in a world where even The Pope is on Twitter, so it’s only natural for religious institutions to establish an online presence that will help them reach a bigger audience. Plus, building a stunning website is a quick way to offer followers a safe online space where they can interact and learn more about upcoming church events. If you’re looking for a Christian theme for your WordPress website, we have a list for you. Below, you can see the Top 37+ best church WordPress themes in our eyes. And just a heads-up – while some of these themes are completely free, some of them are premium. Bridge is one of the best church WordPress themes you can get on ThemeForest. This theme is developed by QODE and it was designed to be multipurpose and highly customizable. For such a small amount of money you get over 350 full demos you can use for any type of website. Among these 350 you can also find church and charity related templates. Bridge contains a bunch of features starting with custom icons, search functionality, social media integration, stunning animations, one click demo importer, auto-updates, magazine and blog functionality, and much more. To truly see what this theme can do I recommend checking out its live preview. A must for any developer, non-profit organization, or church. Charity Events is a modern template designed especially for websites connected with non-profitable organizations. 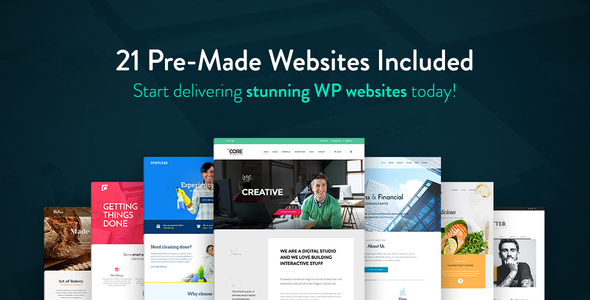 Your website will be ready just in a few seconds thanks to a simple one-click installation. This ready-made solution requires no coding skills. Together with a fully-fledged Elementor Builder and its exclusive widgets, everything will more than simple. You will also get a powerful donation and fundraising plugin that will provide you with unlimited campaigns and donation management. Do not forget to take a complete control over your website using five header variations, unlimited color options, and many other advanced features. Exodus has all the features a church WordPress theme needs. This theme stands out from the rest thanks to its minimal and pristine design. Exodus includes numerous tools and options such as 5 demo variations, free Google fonts, shop page, a donation page and system, sermons page, blog page, 3 integrated plugins, unlimited color variations, full cross-browser compatibility, WooCommerce compatibility, unlimited sidebars, and an intuitive admin panel with a dozen more features. Exodus’s design is ready for all devices and screen resolutions making it easy for your audience to interact with it. 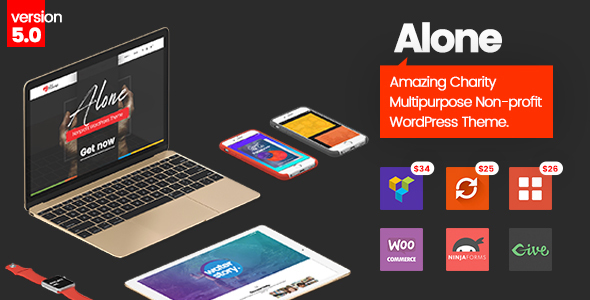 A stunning and responsive WordPress theme that’s fully customizable and fast. What more could you ask for? Church Suite offers an events manager system your followers will surely appreciate. Moreover, it comes with a user-friendly sermons manager and a causes manager to encourage worshipers to lend a helping hand where needed. 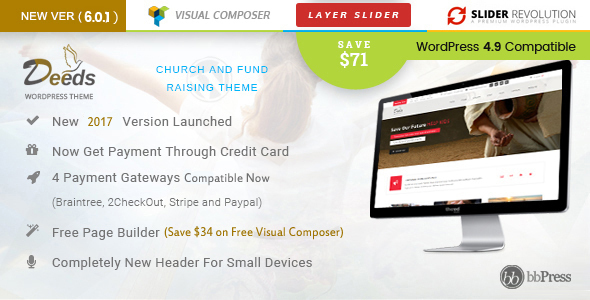 It also packs Visual Composer, a plugin that makes building your religious website easier than ever. All these powerful features make Church Suite worthy of a spot on our list of the best church WordPress themes available. 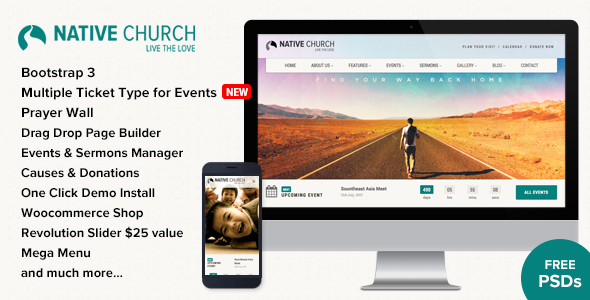 NativeChurch is a multi-purpose WordPress theme with great functionality. It comes with a custom made Events Manager which offers great features like Paid Events, Events Registration, Events Calendar, and more. It also packs an intuitive sermon manager and it allows you to collect donations for causes with an online PayPal system specially built for the theme. Last but not least, the theme is fast, easy to use, SEO friendly, and WooCommerce compatible. Not too shabby. While this theme was built mainly for churches and events, it is also suitable for any kind of website due to its powerful features. The developers offer top-notch support, as the theme comes packed with HD video tutorials for beginners. In other words, you will be able to get your site up and running without any programming knowledge. On the same note, you also have access to a sleek and easy to use drag & drop page, blog posts and portfolio posts builder, entirely based on the popular Visual Composer plugin. 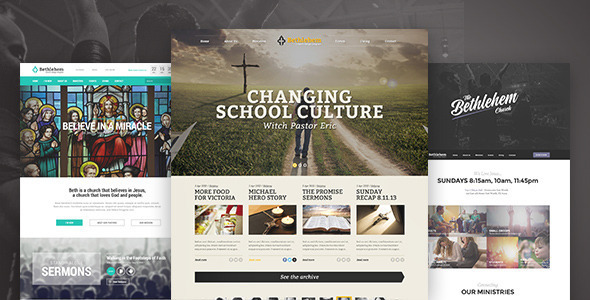 Adore Church is a theme designed and developed mainly for church, charity, non-profit and religious websites. Its gorgeous design and amazing functionality made it worthy of a spot on our best church WordPress themes list. It has a built-in events manager plugin, a sermons manager, and an event ticket booking layout. Furthermore, it also comes with a drag & drop page builder, so keeping your site updated will be piece of cake. If you were looking for an intuitive, flexible, and powerful church WordPress theme, look no more. Bethlehem is fully-customizable, fast, responsive, and very elegant. It comes with two popular plugins, Visual Composer and Revolution Slider, so it packs great value at a decent price. Moreover, it also offers users a sermons manager, it’s integrated with the Events Calendar plugin, and it is WooCommerce compatible. All in all, one of the best church WordPress themes out there. 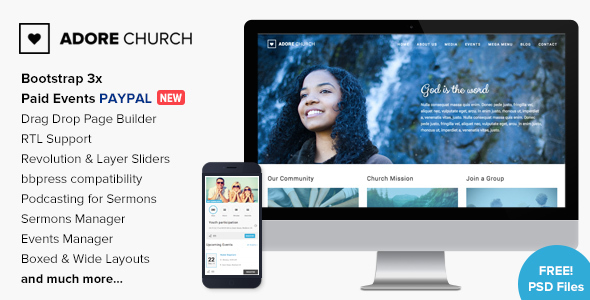 Evangelist is a superb WordPress theme designed with churches, charities, and prayer groups in mind. It’s responsive and retina-ready, comes with a great sermons and events calendar, and the admin panel is a breeze to navigate. What really makes this church WordPress theme stand out from the crowd is the events calendar slider featured on the front page. It looks quite sharp in the demo! Furthermore, the theme offers several built-in page templates that might come in handy – from FAQ and Pricing Page to Donate Page and Services. A responsive theme that likely fits any church’s needs, Spiritual offers gorgeous design and top notch functionality. It has a long list of premium features, including a theme customizer you will love to use. You also get custom widgets to make your job easier and custom page templates to help you save time. Plus, Spiritual is fast and SEO friendly, so your followers will be able to enjoy a great browsing experience. 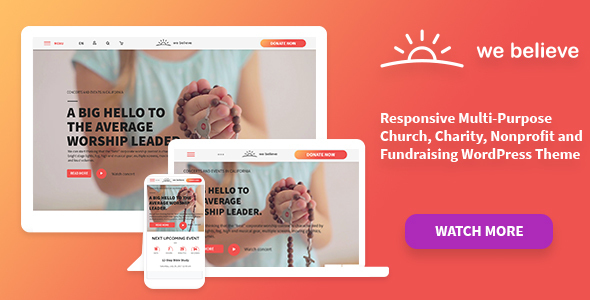 Four main features make this theme suitable for any church out there: Events Calendar & Management, Prayer Wall, Sermons Manager, and WooCommerce Store. Its impressive design is a bonus, and its drag & drop page builder keeps things simple for any site admin without a solid programming background. In other words, it’s got everything you need to build a solid church website without too much hassle. 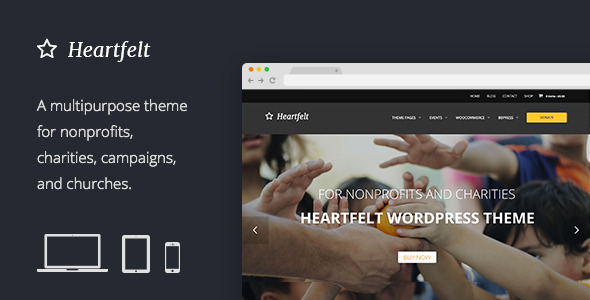 Heartfelt is a multi-purpose WordPress theme suitable for churches, non-profits, and charities. You can customize it live with the WordPress Theme Customizer and keep followers up to date on upcoming events using its Events Calendar System. Moreover, you can also integrate any donation system via a user-friendly pop-up donation feature. Heartfelt is elegant, translation ready, integrated with WooCommerce, and SEO friendly. One of the best church WordPress themes out there, for sure. This WordPress theme comes with support for audio and video sermons, a fully-fledged event calendar, and a community forum. It also offers many other options any church administrator would find useful. It has a plethora of options so you can modify layout, styling, colors, and fonts directly from within the admin panel, with ease. Incarnation also features a dynamic front page slider, community forums, and an events section. We’re going to start our list with something more modern. Maranatha is a theme that comes with a sermon management area. In this area, the user can upload text, audio, and video sermons. Afterwards, the sermons can be organized by topics and books. If you don’t have too much experience with WordPress or if the section above confused you a bit, don’t worry, we have something simpler. With its simple function and intuitive dashboard, Enlightenment Faith allows users to create a church-themed website in a matter minutes. Although the built-in features are somewhat limited, Enlightenment Faith supports a number of plugins that could boost its functionality. Nonetheless, the theme comes with post formats, shortcodes, and a number of different payouts. Again, we have something pretty simple. Despite its generic name, Church is actually a useful theme that allows beginners to design their own church sites. If the theme looks somewhat familiar, it’s only because you’ve seen Omega theme before. Church is a so-called “child theme” of Omega. That means Church shares many of Omega’s features and functionalities. It only has its own design, that’s all. This elegant WordPress theme comes with an adjustable page layout and built-in sliders. The latter allows users to arrange the page layout any way they want. So if you’re looking for something highly-customizable – you’ve found your theme. In addition, Christian Church has all of the usual features you’d expect from a paid, premium WordPress theme. There are more than 80 shortcodes, it has multilingual support, supports both Google Maps and Google Fonts, etc. And here we have a more “niche” theme. As the developers claim, Resurrect is an urban-inspired theme, aimed at young people. It has a built-in sermon section of the site, which allows you to upload sermons in a number of different formats. Users can also browse the sermons by topic. What’s more, Resurrect has full multimedia support, which includes podcasting, among other formats. It has two color schemes – a dark one and a light one. Both support video and HQ image headers. And that’s not all – Resurrect also has galleries, blogging support, and staff profiles. This is a powerful, yet, easily-customizable WordPress theme. It offers 12 colors schemes, but if you want to have a more distinctive-looking website, it also allows you to customize your color scheme. It has full support for church-inspired websites, including events, locations, and of course, sermons. Multimedia is also supported, plus, the site gorgeously displays your video and audio content. With large background images, visually-attractive sliders, and flexible homepage builder, Kerygma is not only modern-looking, but also very powerful. For people who want multimedia content on their church website, Kerygma is a pretty good choice. Needless to say, the theme allows you to upload text, image, audio, and video files. However, it has a useful podcasting section, which allows you to record your own interviews/shows/etc. It also has an easily-manageable staff profile section. The theme we have here is specifically designed for newly established religious groups and churches. Its main purpose is to help users to quickly grow their websites and communities. But the theme also comes with features which are more commonly used by more established organizations. While it seems a bit redundant at this point, we still need to mention that it has support for staff profiles, sermons, and contact forms. You also have an event management section, where you can post about upcoming church events. Additionally, you have multiple page layouts and large header images. The last spot on our list is reserved for Growing Church – another intuitive and easy-to-use layout. All of the popular features a church would need are there. From built-in sermon management to event management. It allows you to attach social media feed and Google Maps to the homepage. The theme also ships with a unique plugin called Page Builder, which allows you to fully customize the pages on your site. Alone is a church WordPress theme that has been developed specifically for creating charity and non-profit websites. Anyone looking for a non-profit or church related theme would find Alone to be extremely useful. Alone’s design is simple yet eye-catching and will instantly allow your audience to notice your website’s purpose. To help you create your website, Alone has over 9 package demos, 3 plugins for free, donation pop-up, carousel donations, MegaMenu, 9 headers, unlimited colors, 3 blog styles, 4 footer columns, events manager, and more. Alone is ideal for promoting your church services and charity events. 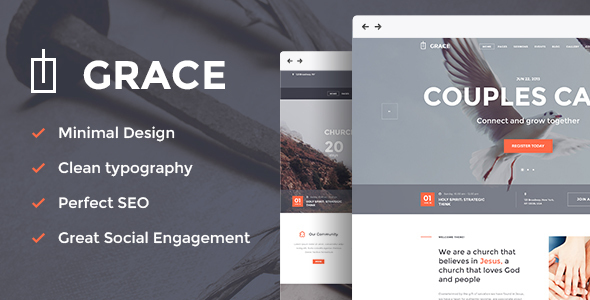 Grace is a WordPress theme that is focused on creating church websites, as you might have guessed from the name. Grace is versatile enough to also be used for charity, non-profit, and religious communities’ websites. With this theme you get to import the demo content in order to give you a head start. You will also find two custom sliders, interactive search, several layout options, advanced blog settings, over 700 customizing options, shortcode builder, Visual Composer, and lots of fonts. One of the most reliable church WordPress themes! My Religion was designed for churches and religious organizations looking to launch a professional and modern website. The demo content of this theme features various homepage demos ideal for attracting new visitors and engaging them with your content. The rest of My Religion’s features contain custom sermons, a donations plugin, scheduled events, shop page, portfolio styles, blog formats, and both Revolution Slider and Layers Slider. 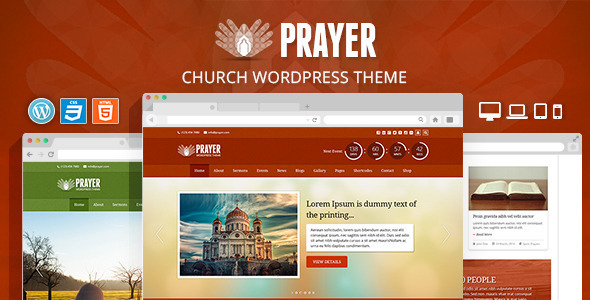 My Religion is a user-friendly church WordPress theme worth purchasing! 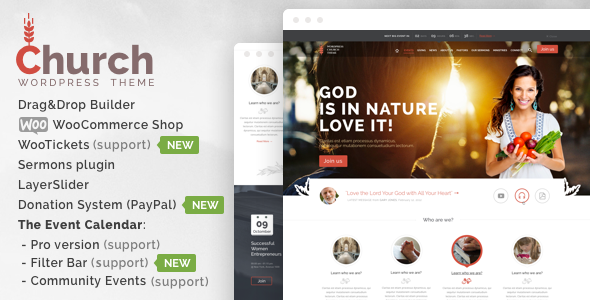 The Core is a multipurpose WordPress theme that religious and charity organizations should definitely try out. To cover a wide range of categories, The Core provides 23 premade websites included with versatile and adjustable designs. There are specific website demos for church and charity, but you are not obligated to choose one of those two. To help you change the layout of your website using only a few clicks, The Core included a visual page builder. You also get 3 different sliders, lots of color schemes, built-in calendar and events, SEO module, contact form builder, and much more. 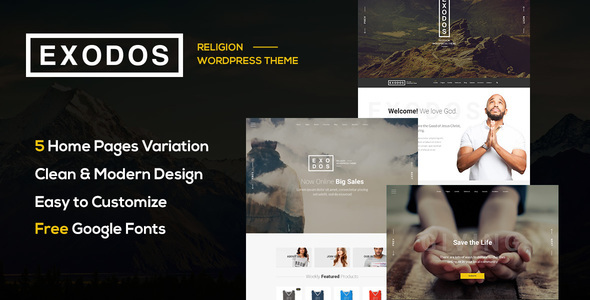 Deeds is a responsive and reliable WordPress theme suitable for church and non-profit organizations. Deeds offers a great selection of homepage demos you can use for your website. To help you even further this theme includes 3 amazing plugins, a donation system, several header options, event management, prayer management, sermon and news management, unlimited sidebars, and submit a prayer form. Its responsive design alongside these incredible features gives you everything you need to build a stylish and clean church website on WordPress. Ichthys has been designed and developed to help promote church organization and church related services. If you want your visitors to listen to your sermons online Ichthys has got you covered by including this with the theme. Ichthys also provides a donation system, events manager, several demos, limitless sidebars, events calendar, Google Analytics built-in, Google map integration, video and parallax backgrounds, advanced headers, and 3 powerful plugins: Visual Composer, Slider Revolution, and Essential Grid. 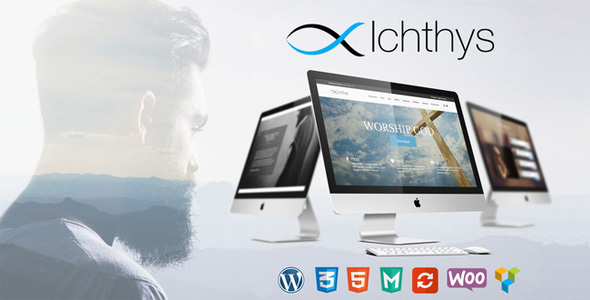 Ichthys is an effective and easy to use church WordPress theme! Pastor’e has been created for crafting church related websites in WordPress. If you want to have a custom and inspiring website then Pastor’e should be your top choice. Pastor’e gives its users the ability to take their pick from various pre-made demos. All the demos’ design will bring something new to your website and generate interest from your followers. 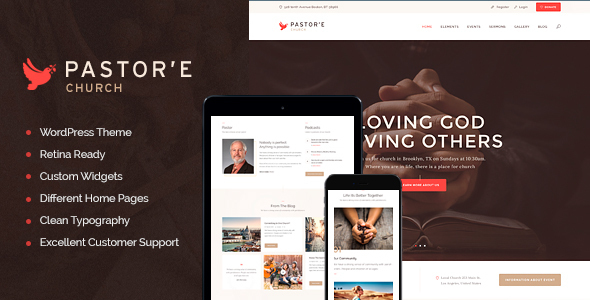 The options given by Pastor’e include a responsive web design, built-in page builder, sticky menus, Fontello icons, back to the top button, useful shortcodes, one page layout, video slider, a bunch of fonts. Launching a church website with Pastor’e is as easy as it gets! 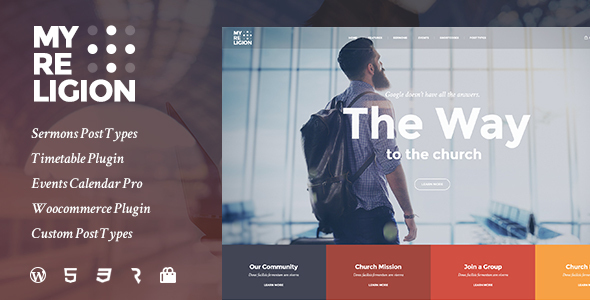 WeBelieve is a responsive multipurpose WordPress theme designed to fit churches, charities, religious organizations, and non-profit websites. To help you design the perfect layout for your website, WeBelieve comes with 3 demo variations and over 20 unique sections. After you have this setup on your website you can start creating your content and adding it simplifying your work. Some of the other features offered by WeBelieve include a flexible events management system, a sermon manager, donation platform, church ministry solutions, and 7 custom headers. 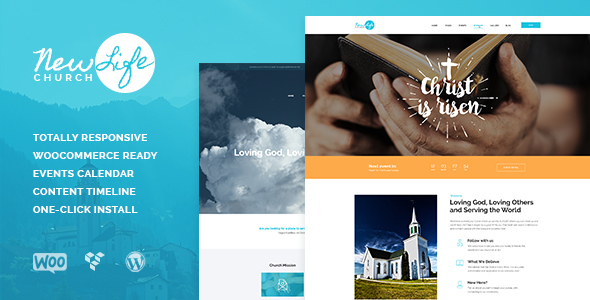 Clearly WeBelieve is a winner among the best church WordPress themes! Divinity is a church WordPress theme built with one sole purpose in mind to help novice web developers craft professional websites. 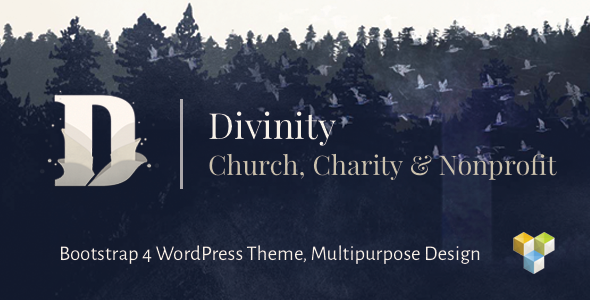 We could not have a list featuring the best church WordPress themes without including Divinity. Divinity has a large number of features including 4 stunning demos, WPBakery page builder, a creative skin editor, lots of font options, sermons, beautiful animations, and more. This powerful theme can be edited through the site customizer making it easier to change or add extra features. Try Divinity! 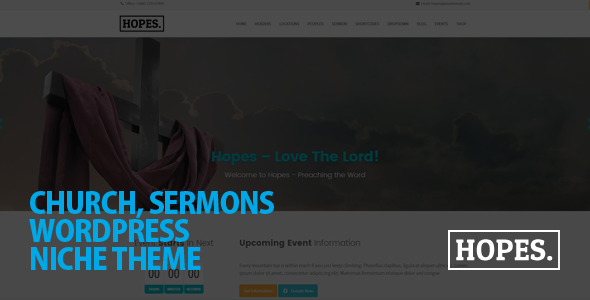 Hopes is a beautiful and versatile church WordPress theme that should be used by anyone looking to promote their organization online. To ensure you have a professional and good looking website, Hopes provides its users with some top-notch features. Hopes’ features include a shortcode generator, 9 post formats, custom backgrounds and subheaders, sticky navigation, 5 header layouts, unlimited colors, a potent page builder, Events Calendar, Slider Revolution, and Business Hours Pro. Promote your website with Hopes! 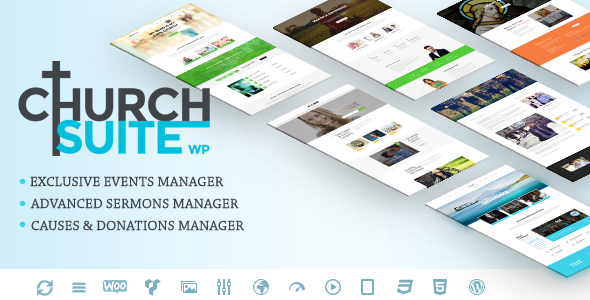 Church WP is the theme to consider if you want your church related website to have a high-quality design and features. Church WP was designed by ThemeSLR to give religious organizations new and enticing options. This theme is packed with amazing features such as church page templates, integration with many popular plugins, powerful theme panel, page builder, video sliders, testimonials block, Google maps, donation plugin, 30 custom shortcodes, and gallery templates. 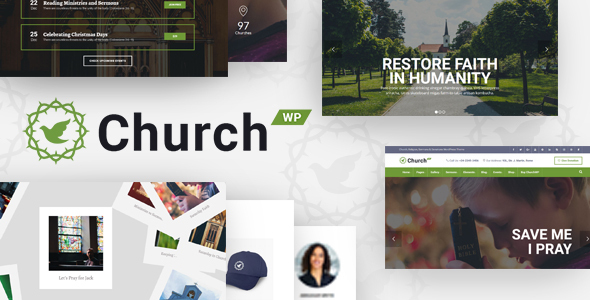 Church WP is a very useful addition to our best church WordPress themes collection. 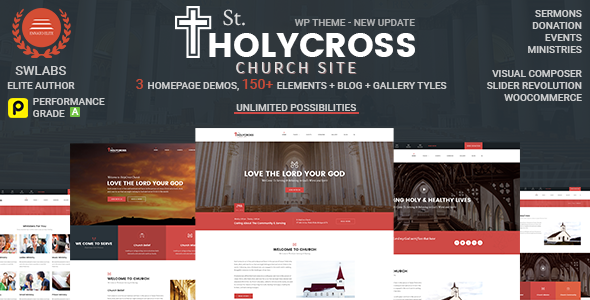 Holy Cross is a creative, exciting, and purposeful church WordPress theme. Thanks to its 3 homepage demos you can create a church related website is a few clicks. Each demo is different and you can choose the one that fits your organization the best. When it comes to features, Holy Cross offers 16 blog formats, 2 header options, predefined templates, drag and drop page builder, multiple post types, carousel slider, contact form, newsletter, typography controls, and some more. Let Holy Cross impress you! Because this post is all about the best church WordPress themes we just had to include New Life. While New Life is not a new theme, it is still being developed and maintained by Axiom Themes having an update just this year. The first things you will notice when installing New Life are its beautiful demos you can instantly choose for your website. They are all responsive and retina ready with colors and typography options that fit this niche. You can also adjust and change the layout however you would like through the theme’s panel. Dunamis is the perfect platform to create just about any type of church or non-profit website using WordPress. Dunamis has a playful and modern design paired with intuitive and useful tools. If you check out its live preview, you will immediately notice its advanced functionality and content focused design. Dunamis is packed with features starting with a mega menu creator, drag and drop interface, parallax design, donation manager, and a booking form. If you are not fully convinced yet, it is worth mentioning that Dunamis is fully responsive, retina ready, and SEO optimized. Make sure to keep in on your list! HelpingHands is a responsive church WordPress containing 6 unique demo variations to help its users create standout websites. Included with HelpingHands you will find Visual Composer, Slider Revolution, and Ultimate Addons which are 3 powerful premium plugins that you get for free. Apart from these plugins, HelpingHands also includes donation campaigns, unlimited color variations, full width and boxed layouts, advanced control panel, SEO optimization, and multiple page templates. HelpingHands’ customer support team is incredible and beyond eager to help giving a good indication of how dedicated they are. Get HelpingHands! Charity is one of the best church WordPress themes you can use to create religious websites because it includes a wide range of options. Among its options you can find multiple demo homepages perfect for promoting your services and events. 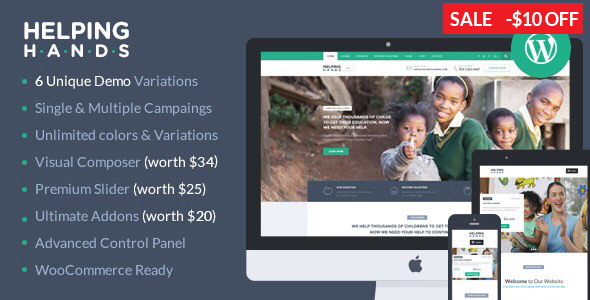 If you check out Charity’s features you will find single cause demos, layout formats, advanced slider, WooCommerce support, EasyPay, Stripe integration, RTL support, Event Manager, sticky headers, Google web fonts, and useful shortcodes. Moreover, Charity has been optimized for speed and search engines. 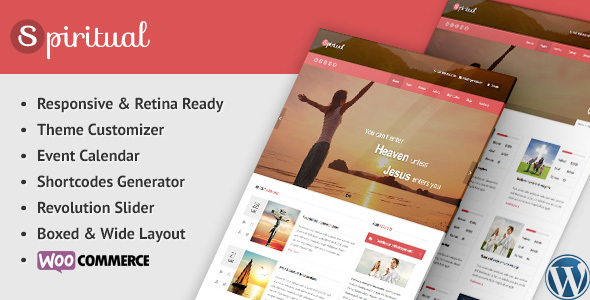 Forgiven is a creative, contemporary, splendid, and versatile church WordPress theme. Forgiven is very easy to customize and tweak by using the admin panel which contains all theme’s options and features. Forgiven has many great qualities including four amazing plugins Soliliquy slider, Envira gallery, Visual Composer page builder, and Slider Revolution. Forgiven is a great choice! Why Choose One Of The Best Church WordPress Themes On Our List? We’re way past the time when churches weren’t paying that much attention to how their websites look like. Most church administrators are now aware that a strong website is a great tool to accommodate the spiritual needs of their followers and reach a wider audience. For a website to really appeal to worshipers though, you need a WordPress theme that caters to your church’s needs. Look for minimalism, readability, excellent user-experience. In other words, pick any of the best church WordPress themes above and you will be able to build a modern and eye-grabbing religious website that will surely appeal to your online community. Most themes on our list come with features that should be useful to any church administrator out there – like donation widgets, event management, sliders, social media integration, and more. They’re as beautiful and user-friendly as they are feature-rich, so your followers will enjoy a flawless browsing experience. Plus, they’re insanely easy to set up and customize. You can have your site up and running in a matter of minutes. Eager for more WordPress tips and tricks? Keep an eye on our blog or sign up for our newsletter. We hope you found this article helpful. And now it’s your turn: tell us, do you have any experience with running a church site? Are you, perhaps, starting your first website? Please share your experience with the rest of us by leaving a comment below.